If you don't have time to read books, one of the best alternatives is to listen to audiobooks. You can find free audiobooks from Audible and so on. As the most popular streaming music platforms, many users may not know Spotify also offers lots of non-music contents such as best free audiobooks, dramas, videos, podcasts besides songs. The disadvantage is that there is not a fixed genre for audiobooks from Spotify. It maybe difficult for users to locate the contents. In addition, if you are using the Spotify free account, you may find that there is not a way to skip tracks. This means if you are listening to Spotify audiobooks on mobile device, you will not skip the audiobooks easily. For your convenience, here I will offer the best tips to help you locate audiobooks as well as downloading them for offline listening. There are many best audiobooks from Spotify such as Game of thrones audiobook, Harry Potter audiobook. You just need to type the name and append the audiobook to search the files from Spotify. If you don't know the name of the audiobook you want, you can also try the following methods. Spotify contain lots of audiobook playlists. But unlike the songs, albums, videos, podcasts which you can navigate through menus directly. You have to search the Spotify playlists directly. 1. Launch Spotify app from your desktop computer. 2. Type in "audiobook" on the search box, it will list all the contents related to audiobook. 3. Please scroll down to the playlists, you will see different audiobooks from many artists. All these playlists are curated by individuals, not publishers. 4. Check out all the Spotify playlists to see if there is one you are interested in. When you check the audiobook playlists on Spotify, you will see the related artists. If you find an artist you like very much, you can click the artist to list all the audiobooks related to the artist. It will help you narrow the results and save your time significantly. This method is foolproof. If you have found an audiobook you like, you just need to click "Play" button to start playing it. Sometimes if the list only contains the first chapter, you can also click the 3-dot icon beside and choose "Go to Album" to find the entire album. Audiobooks are usually long which can last for several hours. Obviously we can't finish listening all the time. What is even worse is that there is not an option to bookmark the audiobook so that you can continue to listen from where you have left off last time for free users. Please just don't be concerned, my friend. 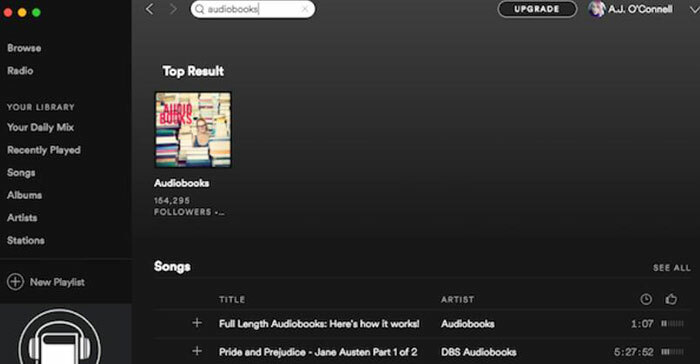 You can also download Spotify audioboooks as MP3, then you will be able to play them on any audiobook players with bookmarking feature with a downloading tool. 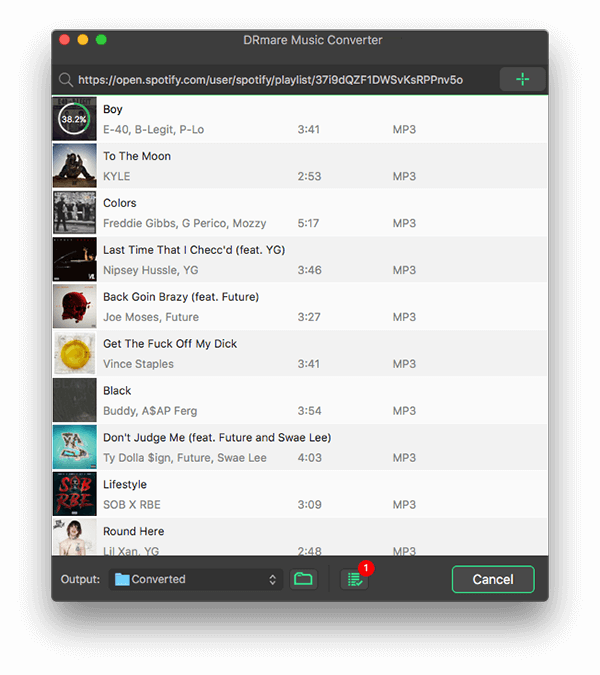 Spotify Music Converter for Mac is an excellent tool to convert any tracks from Spotify developed by the famous DRM solution provider called DRmare. It is not only easy to use but also contains powerful features. 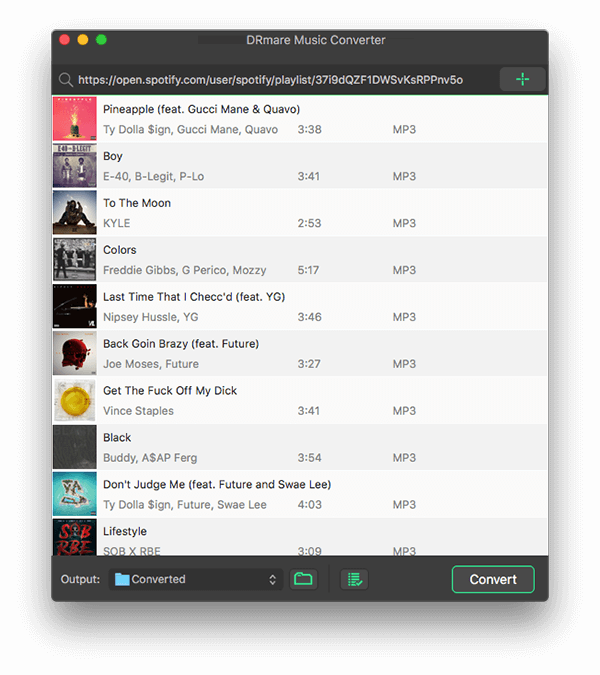 You can free download DRmare Spotify Converter by clicking the download button above to your Windows or Mac computer. After that, you can follow the instruction to convert audiobooks to MP3 for offline listening on your car stereo, MP3 player, portable speaker, mobile phone and so on. You can open DRmare software and Spotify app. Then search the audiobook you want from the Spotify app and drag it to the DRmare software screen. If you have multiple audiobooks you want to import, just repeat the same step. 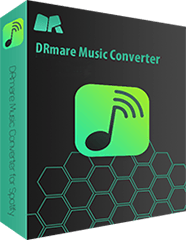 DRmare offers many different output formats like MP3, M4A, M4B, AAC, WAV, FLAC. But the best format I'd like to recommend is MP3. It can not only keep the high quality but also has best compatibility. 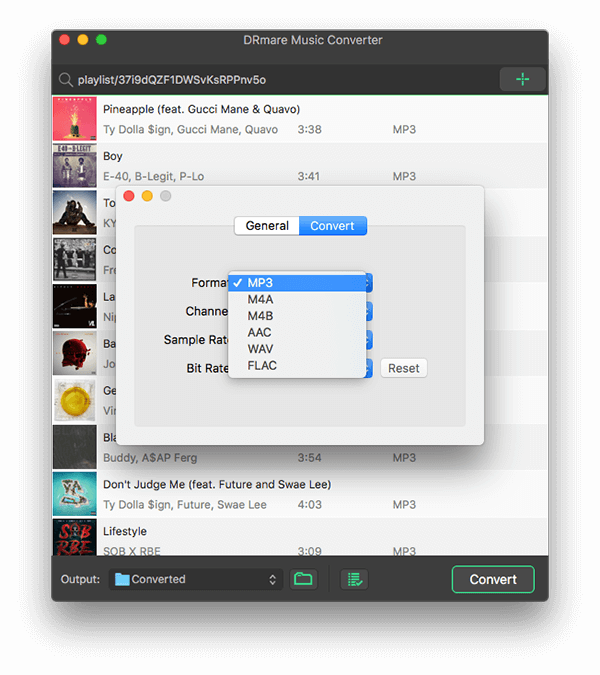 Finally, you can select an output folder and click "Convert" button, it will start to encode your audiobooks from Spotify to MP3 quickly. If you have multiple larger files, you will have to wait a while. Just let the software to convert by itself and you can go to do other things during this process.